I know you’re a sports fan, and what does every sports fan love to do? Show off their team pride. If you’re like me, you’ve got a closet of jerseys, a wall full of posters, some sort of autographed memorabilia, or even a jersey on your Xbox Avatar. If you really want to prove your love for your team, you need to check out SkinIt.com. While SkitIt makes since for numerous items including the PS3, PSP, Wii, DS, and others, I recently got one for an Xbox 360 S and another for my Acer Aspire One netbook. 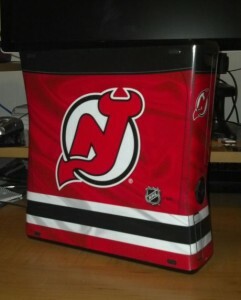 As a life long “Jersey Boy” of course I made sure to get a Devils skin for my Xbox 360 S. The SkinIt skin covers the three main sides of the Xbox. As you can see the aplique fits the console perfectly and really makes it a sports fan dream. What you can’t really tell from the pictures is the high quality of these decals. They are made of high quality vinyl and form a great bond with the system, while still being easily peeled off if you want to change them out later on. What is really nice about these skins are how easily they can be applied. Usually applying decals to devices with rounded edges leaves a little bit of a ripple around the edge, but due to the quality of the vinyl that SkinIt uses it is very easy to clean up the curved edges for a great finished look as if it was a custom paint job on the system. Aside from having a massive selection of pre-made skins from a variety of artists in tons of styles, SkinIt also lets you create your own custom skin. 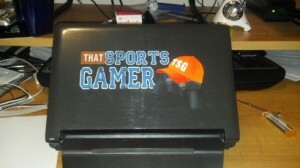 As you can see above I created a custom skin for my Acer Aspire One netbook with the ThatSportsGamer logo created by Ryan Lewis. I was really blown away by the quality of the print. There are other companies out there that produce similar products to SkinIt but as of right now, they are the best in the business from what I have seen. Even better, if you follow their Twitter account @SkinIt you’ll always find a good bonus coupon.